The event also underscored Oregon State University’s growing presence in cybersecurity research, according to Assistant Professor Mike Rosulek of the School of Electrical Engineering and Computer Science (EECS). Rosulek, who specializes in the theory of cryptography, said he was already getting emails from students before he started his position here in fall 2013. 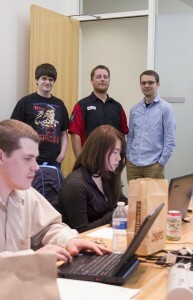 “The students have been chomping at the bit to have fun hacker stuff like this to do,” Rosulek said of the CTF event. Students had all day to solve a series of security problems of varying difficulty, gaining more points when they solved the more challenging problems. All participants were treated to lunch and snacks. But the best part was the experience, said Marie Pardo-Garber, a sophomore in EECS who has been interested in cybersecurity since high school. “It’s been really fun. It’s a lot more laid-back than I imagined so it’s great you get a chance to ask questions while you work and get a feel for what the job sector is like,” she said. Raytheon SI hosts similar CTF events across the country to spark more interest in cybersecurity as a career for computer science students. Stricklan said it often is the catalyst for cybersecurity student clubs, and a fun way to recruit new employees. “We are looking for interns and full-time people, so that’s part of the reason we do this. But we are all just hackers at heart,” Stricklan said. Raytheon employees, Alex Taylor and Ryan Snyder, were also on hand at the event. Snyder was recruited at a similar event at University of Oregon three years ago and is now a full-time employee. The Oregon State CTF event drew 16 students — more than the typical number for a first-time event, which means Raytheon will likely host it again next year. Students who are interested in learning more about cybersecurity or forming a club can contact Mike Rosulek at rosulekm@eecs.oregonstate.edu.